Debut, location listed as 1991 - Tepic, Nayarit, but appears to have occurred years earlier. Talented CMLL tecnico mini. He's been with the promotion since the original mini crew jumped to AAA. As indicated by the name, he's a mini version of Ultimo Dragon. 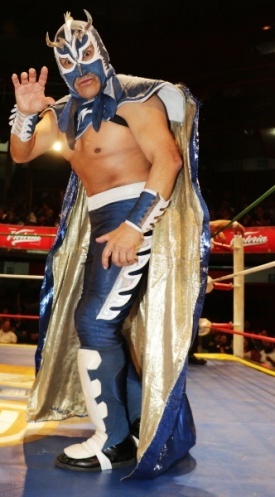 A fearless flyer, Dragoncito was well regarded but seldom seen until CMLL began adding more TV shows in the late 00s. One of his few earlier matches that did slip thru was the one where he lost the minis title for the second time (after winning it in either a phantom or unknown fashion.) During the match, Dragoncito attempted an Asai Moonsault onto Pierrothito but missed, hitting the Arena Coliseo floor hard. Dragoncito appeared to be bleeding from the mouth, but amazingly pulled himself up and back in the ring and finished the match. In recent years, Dragoncito's big trademark spot has been an impactful thru the ropes tope con giro. After hitting his opponent (often Pierrothito), Dragoncito often bounces off and into the third row in spectacular fashion. This page was last edited on 18 August 2018, at 01:23.